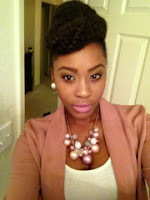 Nappturally Chic Jeré: Protective Styles!!! My goal is to do a protective style that last from Monday to Friday. Deep Condition on Friday afternoon, and wear my hair out on the weekends. It is going to be hard, I'm probably going to get bored, but protective styling is way more important than uploading cute pictures of my hair to Instagram (lol). 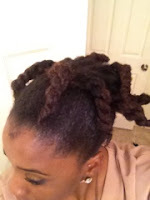 Do you want to join me in a Protective Style Journey Challenge? Take pictures of your protective style week by week for the rest of April and send them to nappturallychic11@gmail.com. The best Protective Style will get a special shout out on my social media pages and this blog site. Who's in?? 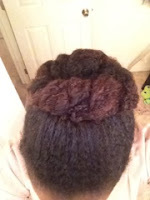 Here are my tips on the protective style I have been rocking this week- faux bun using Marley Braiding Hair. 1) Loosely gather hair into a large puff using a large headband instead of a small ponytail holder. Using a large headband that is doubled or knotted will ensure that your hair isn't pulled too tightly and will protect your edges. 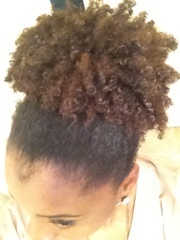 Moisturized ends with h20, leave-in conditioner, and seal with oil. 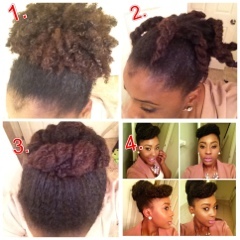 2) Divide your puff into medium sections and twist each section. Make sure you seal the ends with additional oil. 3. Wrap twist around and create a bun making sure all your ends are tucked away and protected. 4) Add marley braiding hair and style as desire. 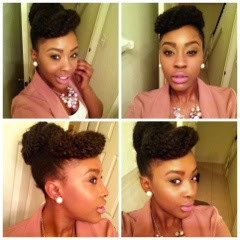 Try a side faux pompadour with a faux bun for some versatility.